Inlays and onlays are alternatives to fillings that restore decayed tooth structure. 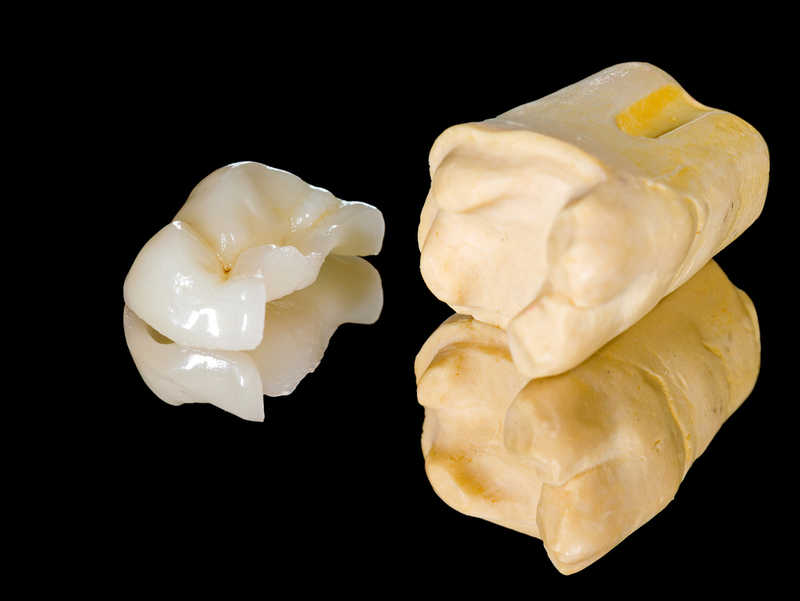 Both are fabricated out of gold or porcelain (ceramic) by a dental laboratory and then bonded to the tooth. Inlays cover the grooves of your teeth, while onlays cover the grooves and cusps of your tooth. Inlays and onlays generally last longer than traditional fillings and are much stronger as well. Preservation of natural structure and appearance: inlays and onlays are conservative restoration approaches that don’t require the complete reshaping of the tooth. In addition, inlays and onlays are also able to be matched to your teeth’s natural color, meaning they will blend in well. Can fit into tight spaces: inlays are especially beneficial for fitting into the spaces between teeth and can effectively seal the tooth and prevent bacteria from entering. 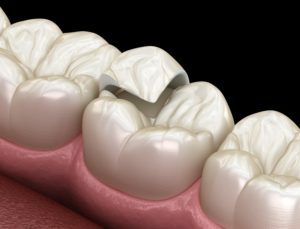 Durability: inlays and onlays are stronger than traditional fillings and due to their fit, they are more resistant against damage and last a long time. Easy to clean: the fit of inlays and onlays also makes them much easier to clean than a cap or crown. Inlays or onlays are especially great for weak teeth. By applying an inlay or onlay, the tooth immediately becomes stronger than before. In fact, teeth with inlays and onlays can take about 50-75% more chewing force than those treated with traditional fillings. You may need an inlay or onlay if you have damage from decay on your tooth, or if you have been told that you need a cap or a crown. To find out if an inlay or onlay is the best treatment option for you, schedule a consultation with Fedorciw, Massoumi & Kolbig today! 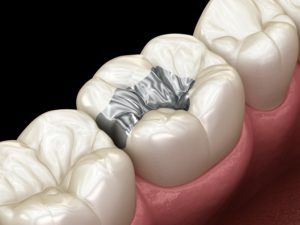 Why should I choose an inlay or onlay over a traditional filling? 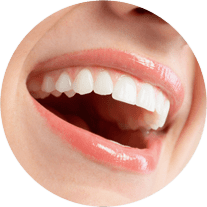 For starters, inlays and onlays are custom made to fit precisely to your teeth, while traditional fillings may shrink slightly during the hardening process. This means that traditional fillings can be damaged easier and may not last as long as inlays and onlays. What are inlays and onlays made out of? Inlays and onlays are made out of gold or porcelain (ceramic). Gold inlays and onlays provide the strongest material that is the most resistant to damage or replacement. Due to this strength, it also only needs a thin layer, which means the majority of your natural tooth structure is preserved. The one major drawback of gold inlays and onlays is their metallic appearance. Because of this, they are most ideally suited for teeth towards the back of the mouth. The other material, porcelain (ceramic), offers an aesthetically pleasing alternative that can be matched to your natural teeth. This means that your inlay or onlay will be indistinguishable from your natural teeth. However, porcelain can fracture easier than gold. Because of this, a thicker layer is required to maintain its strength, meaning more of your natural tooth structure is lost. Porcelain has also known to be abrasive to the opposing teeth and can cause them to wear down faster. Our dentists will help you to choose a material for your inlay or onlay based on a number of different factors. Such factors may include the location of your tooth and the inlay or onlay, the size of the inlay or onlay, your oral health, and your dental habits. What should I expect when getting an inlay or onlay? When getting an inlay or onlay, you can expect that your tooth will be numbed and the decay will be completely removed. 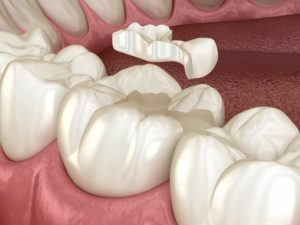 Once the decay has been removed, a dental impression will be taken of your tooth and a temporary filling will be placed. This dental impression is then sent to a dental laboratory that will fabricate a custom inlay or onlay. You will continue to use the temporary filling until the permanent restoration is completed. Then you will return to our office and we will bond the inlay or onlay to your tooth using resin that hardens under a special light or permanent cement. How much do inlays and onlays cost? The cost of inlays and onlays depend on whether it is an inlay or onlay, the tooth it is being applied to, the type of material being used, and the size of the inlay or onlay. Considering these factors, an average cost for an inlay can range from $250-$1500 and an average cost for an onlay can range from $350-$1500. 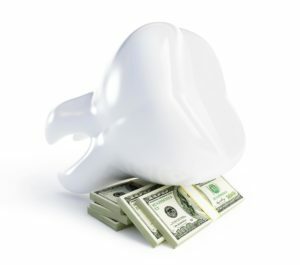 If you have dental insurance, coverage options are usually available to help offset the cost of inlays and onlays. However, the level of coverage offered depends on how your insurance company classifies inlays and onlays. Some dental insurance companies classify them as a basic service and offers a higher level of coverage, while others classify them as a major service and offers a lower level of coverage. Our office will coordinate with your dental insurance to determine your level of coverage. How long do inlays and onlays last? Inlays and onlays have an extremely long lifespan for dental restoration methods and can last anywhere from 10-30 years, with most lasting around 20 years. Is there any special care needed for inlays or onlays? Inlays and onlays do not require any additional care beyond your normal dental routine. An ideal dental routine consists of twice daily brushing, once daily flossing, and dental checkups at least twice a year. If you would like to experience the difference inlays and onlays can make for your smile, call our office today and schedule a consultation! Fedorciw, Massoumi & Kolbig are happy to serve patients in Cromwell, Middletown, Rocky Hill and other surrounding areas in Middlesex County (including Berlin).